Today I’m going to focus on something so many photographers seem to get stuck on, which is how to write a good blog post without sounding like a broken record by saying the same things over and over again in every post. In the previous post in this series, we looked at the important benefits of photography blogs and how you can get more clients interested in what you do by writing an effective blog, which is obviously great for marketing. A lot of people still want to know what actually goes into producing a good post for their photography blog. For example, one question I hear a lot is if there’s a recipe for creating posts people will want to read and share with their friends. The other day, I was talking with a photographer who specializes in kids portraits and when we started talking about her blog she sounded really frustrated with it. I totally understand the need for a blog, I do, it’s there to help me connect with the right people and help them see more of who I am as a person, an artist, and a photographer. So I get that. And, everything went fine the first few times I posted, but then I realized I was saying the exact same thing every time, and couldn’t figure out how to make my posts different. I asked her what she meant by, “always saying the same thing”? It’s like my posts all came out of a cookie-cutter! For example, here’s the latest session with xyz kids, they were so cute and we all had such a fun time creating the photographs, and mom was over the moon with what we did for her, blah blah blah… followed by some photographs. In fact, the photographs were really the only things that were different from post to post! Right, and I bet you’re thinking something similar yourself, aren’t you? The big question, then, is how to write a good blog post that doesn’t feel like it came off some kind of mass-production conveyor belt. While I don’t believe there’s a specific recipe for that, there are still some guidelines we can follow to make sure we cover all the bases. However, before we jump into all that, what the heck is a “good blog post” anyway? What does that phrase really mean, and can it even be quantified in any meaningful way? How To Write A Good Blog Post—What Does It Mean? If you look around the Internet, at the many blogs out there, and you examine them closely, you’ll see a lot of comments like “great post”, or “awesome article”, but with very little to say about what was so great or awesome about the actual content. Such comments were obviously not intended as genuine compliments to the author, but were left simply to get a link or to tap into the post as a potential source of visitors to their own website. That’s really just one level above being spam, and definitely not the way to go about creating any serious engagement with other bloggers, and it really does nothing to establish the post in question as being great or awesome, regardless of whether it is or not. A post that delivers on the promise the author makes in the title in a way the intended audience finds valuable or entertaining, and which fulfills the goal the author was seeking to reach. In other words, it’s all about results – both for the reader and the photographer. A blog post that does all that will usually have a good number of social shares, a reasonable number of thoughtful comments that add value (if the blog has comments enabled), and will pull its weight in the marketing effort for the photographer who wrote it. I’ll talk a bit more about what constitutes a “promise” for the reader, and the kinds of goals you might have in just a few minutes. But first, there’s something important we need to talk about that often gets in the way for a lot of photographers, and can even prevent some people from blogging to begin with. That “something” is search engine optimization and, before you tune out on me here, I’m going to say straight out that you do NOT need to worry (at least very much) about doing SEO on your blog posts. Yes, you read that correctly—SEO is mostly pointless for the vast majority of the blog posts you’ll be writing for your photography business. But, Nigel, isn’t SEO one of the BIG reasons why blogging is important to begin with? Everyone keeps saying how much Google loves blogs and how SEO-friendly WordPress is, and all that kind of thing! Yes, it’s true that Google loves blogs because WordPress typically has good SEO, and the search engine optimization you should be doing really applies more to your static pages, such as the website content, frequently-asked questions pages, and any special resource pages that you create for your audience. There’s more on this topic in the SEO For Photographers Made Simple guide. It might help to back up a little here for the benefit of those who might not be 100% familiar with how WordPress deals with your website and blog content. Posts make up the diary-style entries on your blog, and can be thought of as being similar to news stories. These would be posts about your latest projects or sessions, press releases and studio news, collaborations with other vendors, and random musings from you, the photographer. Pages hold content that we think of as evergreen. With the exception of sales pages for limited-time offers, they typically have content that’s independent of when it’s seen by the user, such as your “about” page, contact page, services and session information, and answers to frequently-asked questions. If you remember to use posts and pages in their proper context, then you only need to do any serious SEO on pages, but it’s mostly wasted on posts. But why? Surely, using my important keywords in posts as well as pages can’t do any harm, right? Actually, doing SEO on blog posts for a small photography business doesn’t really help all that much. Also, if done incorrectly (which is rare, but still possible), it can actually hurt your search engine rankings. As a small business that operates within a limited geographical area, the number of useful keywords you can realistically target is pretty small, so it’s not going to be very long before you start repeating keywords in your blog posts. Unfortunately, optimizing multiple posts for the same keywords confuses Google and actually dilutes the results you want for the pages that should rank for those phrases. For example, if you’re a portrait photographer here in Memphis, it’s tempting to just add the words, “Memphis portrait photographer” to the end of every blog post title and in the posts themselves, but Google is going to see that as a blatant attempt to manipulate the search rankings. As a result, the actual page on your website that’s supposed to rank for that phrase could end up being penalized or suffer a drop in ranking. In short, unless your blog post talks about a topic that does have SEO value for your website that you haven’t already covered elsewhere, then you don’t need to worry about SEO too much. That’s actually good news, right? With all that said, I DO recommend you install and use the WordPress SEO plugin by Yoast on your blog. You’ll obviously need it when you create pages, but you’ll still use most of the plugin functions on your posts, with the exception of the “focus keyword”, which is used only when you actually want to optimize a piece of content for a specific keyword phrase. 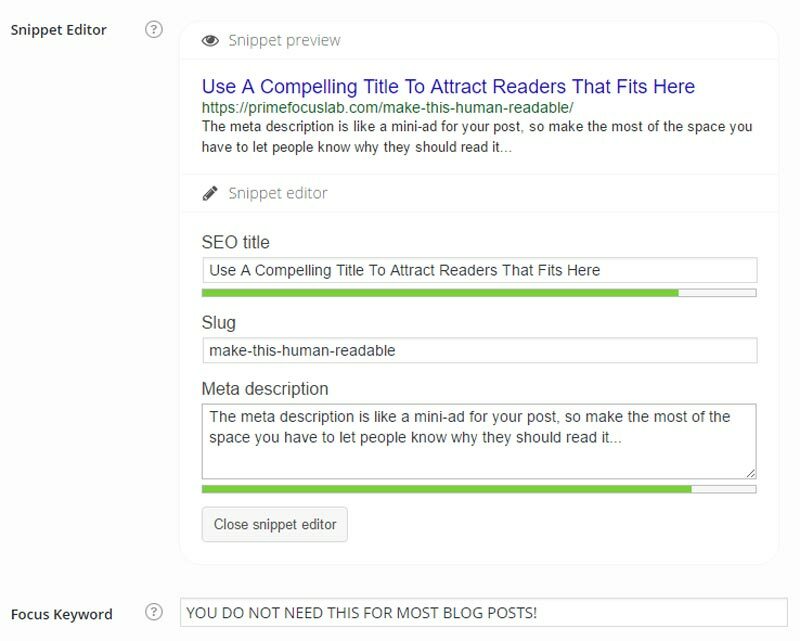 I’ll come back to the SEO plugin information you need in a few minutes, but let’s get started with how to write a good blog post that informs and engages your customers and prospects. You’re ready to start publishing a new post on your photography blog, so you sit down at your computer and stare at the empty screen for a couple of minutes, not sure where to begin. This is where the self-doubt starts to set in, otherwise known as writer’s block, and it’s easy to allow yourself to get distracted by everything else, except the task at hand. You start to worry about what to write, and the whole thing feels a bit overwhelming. Take a deep breath, and don’t take this so seriously that it becomes a massive headache! Remember, this is meant to be a friendly piece of content that connects with people, not a major example of literary history. Relax And Remember This is NOT A Writing Competition! The first thing to do is relax and remind yourself that this isn’t some kind of writing competition! You’re not being judged on how you write as much as on what you have to say and how you make people feel and, even then, there’s very little happening in the minds of your readers that we could really call “judgment”. A lot of the photographers I talk to tell me they have big problems seeing themselves as being able to write, whether that’s for their blog or the content on the rest of their website, but the main issue seems to be the natural tendency we have to think we have to be in some special “writing frame of mind” in order to do this properly, which is really not the case at all. Quite the opposite, in fact! As counterintuitive as this sounds, the more you relax and stop trying to write, the easier it gets – and the best way to do that more easily is to practice, right? One way to make your writing feel more like an informal conversation than a stiff blog post is to imagine having that conversation with your favorite client or ideal customer. As a personal example, I’ve noticed that the engagement on my own posts has increased considerably since I started writing them with the aim of speaking the content in the form of a podcast. To do that, I just imagine I’m talking with someone specific, and then let the words flow naturally, rather than trying to write in the more formal way I might use for a serious paper. Now, is all this easy? No, but it’s not that hard either, and practice definitely helps you to improve over time. With the constraint of trying to write formally removed, you can focus on what you want to talk about and what the goal of your blog post is going to be. It’s important to know, before you start, what the purpose of your post is – what do you want the reader to do after they finish, for example, and how does this post fit into your overall marketing plan? It may be that you don’t have a money-related goal in mind, such as booking a session with you, and that’s fine, but then you should at least have something that moves the reader further along your marketing funnel, such as adding themselves to your email marketing list, or engaging with you on social media. The one thing you don’t want to do is have them finish reading your post and then find themselves hanging with no clear next step. In that case, they’re more likely to leave your website altogether and they may not come back any time soon, if at all. As I mentioned at the beginning, I don’t think there’s a definitive recipe for creating the perfect blog post, but I have identified 7 distinct steps you can follow to help you avoid missing out anything important. It’s very tempting to think that, since you’re a photographer, the only things you can write about have to do with the actual photography projects you have going on, right? In fact, I get 2 or 3 emails every week from photographers who feel trapped in a Catch-22 situation because they want to use their blog to attract new people but they currently have no jobs to blog about. They have no work on the books because they have no work to talk about on their blogs. If you know your ideal customers very well, what they like and what’s important to them, you can find resources and information they would be interested in and then use that as a basis for your own content. I don’t mean just copy it verbatim, but you can put your own spin on it and add your opinions and ideas, or even curate the original content by linking out to it alongside your editorial comments. Pinterest is a really good source of inspiration for this, and you can even create your own infographics and visual content that can be shared by and with your ideal customers that will keep people coming back to your blog. Compile your own dictionary of emotionally-charged words and interchange them in your content to keep it fresh and exciting. Talk to your clients in depth before, during, and after the project and then include short quotes from them in your blog posts. Use testimonials from your clients – more on that in a minute. Open up about your own personal thoughts about the project or session. Describe the scene in detail and remember to use all the senses. The sense of smell, for example, is one of the most powerful at evoking memories attached to emotions, and it even works very well in the written form. I know this might seem like a challenge at first, but if you stick with it, you’ll find it energizes you and starts to feel like fun, which is great because that will shine through in your writing, making it more engaging still. Dealing with the post meta data might seem like a giant yawn-fest, and it’s certainly not the most exciting part of writing a good blog post. But it does pay to make sure it’s done right, even though we’re not really concerned with the SEO aspects of it, as I mentioned earlier. How to write a good blog post: Use a good title, forget the focus keyword, write a compelling meta description, and make sure the URL is human-readable. The post title is usually what your readers see as the main headline for your blog post, so you should make this descriptive and interesting. It’s often been said that the main function of any headline is simply to catch the reader’s attention and compel her to read the first line of the copy, so it’s worth spending some time to write something more engaging than “Baby Portraits by Memphis Baby Photographer”. The SEO title is a little different because that’s the title Google cares about. Although we’re not really concerned with keywords in our blog post titles, you should still try to fit your SEO title into the recommended amount of space so that it doesn’t get cut off when displayed in search results. The WordPress SEO plugin does a good job of helping with that. Adding a compelling meta description to your blog post is also worthwhile, and you should think of it as a mini-ad for your post because the meta description shows up in search results and also on social media. Keywords are not necessary in the meta description, so you can use that space to make a pitch for your post, as it were. Another piece you want to pay attention to is the URL of your post, often called the permalink or slug. This is usually a place where we put keywords for SEO purposes but, more importantly in the case of a regular blog post, you want to create URL’s that are readable by a human being, as they can be a good signal of what your post is about. With social media being such a huge part of our lives these days, you’d think we’d have the mechanics of sharing our content all figured out, but the reality isn’t quite as pretty as that. Each social network seems to have its own way of interpreting the posts we share, and their requirements for the meta data they look for in order to do that, but we can take care of most of it with something called “open graph meta data”. In the WordPress SEO plugin, there’s a “social” tab where you can enter most of this information, and that seems to work for most situations, so do make sure you fill that out, especially for Facebook. For example, you can specify a Facebook-specific title and description if you want to. But the most important element is the image Facebook displays whenever the post is shared. At the time of writing this, the preferred image size is 1200 x 627 pixels, so you’ll need to create an image using those dimensions and then upload it to WordPress in the social tab of the SEO plugin on your post. The image isn’t actually shown in the post itself, but is used by Facebook as the thumbnail when the post is displayed in the news feed. The odd man out in the social networks, at least it seems that way to me, is Pinterest. While you can pin just about any image on Pinterest, and there are some good plugins to help people do that, the images that tend to perform best on Pinterest are tall vertical images, rather than horizontal ones. For that reason, it may make sense to create an image specifically for sharing on Pinterest, and then use the Pinterest widget builder to create the necessary code you can then paste into the post, along with the image, as a pin-it button. It’s time to move on to the post itself, and some tips on how to make it more engaging or to improve its performance with respect to the goal you want the post to achieve. Now, there are loads of ways to go about this, so I’m not laying down any kind of rules here, just guidelines to get you thinking about all this. I’m sure you can find other strategies that work equally well or even better, and you can even adapt what I’m sharing here. But, if you’re stuck at the beginning, and you have no idea where to start, this should help. First, I recommend starting out with a prominent featured image. 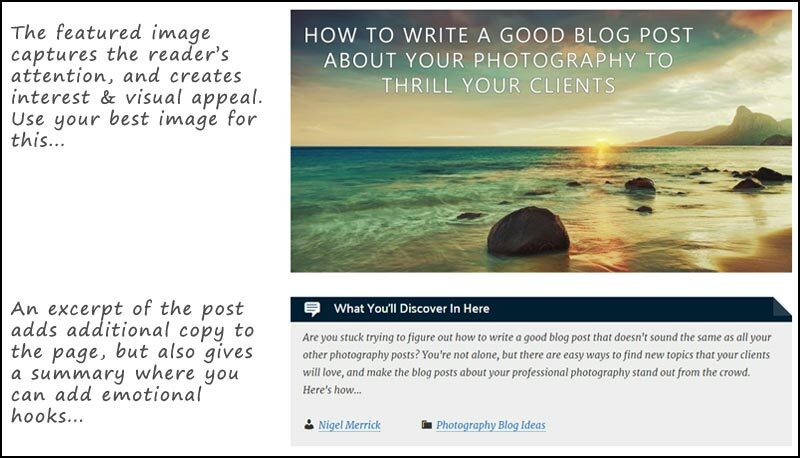 How to write a good blog post: Start with a featured image that captures attention and creates interest. An excerpt can provide an emotional hook to get people reading. Many WordPress themes, including some of those based on the Genesis framework from StudioPress, display the featured image you set for the post at the top as a kind of mast head, which is great for setting the scene. If your theme doesn’t do that, don’t worry, you can still manually include an image at the beginning of your post, preferably a horizontal photograph that occupies the full width of the screen, but don’t forget to include suitable ALT and TITLE text. You can also use the caption on your featured image to introduce the topic of the article, or as an excerpt that gets people interested in reading more. Having decided what to write about, you now need to actually write the text for your blog post. At this point, don’t get caught up in the complex technicalities of writing – just relax, and say what you want in the same way you would if the reader were sitting there having a fun chat with you over a cup of coffee. Yes, you should write around 300 words or more, but that’s not hard to do, especially if you take some time to think about how you want people to feel when they read what you have to say and your photographic stories. Now, this next part is where it gets a little hard to explain, but I’ll try my best because this really impacts the readability of your post. It also affects how long people will spend on it, as well as the chances of them taking the action you want them to at the end. We’ve all seen those blog posts that look like one gigantic mass of hard-to-read text in huge paragraphs with hardly any breaks. How easy would you say those are to read online? That’s because the way we read online is very different to how we read a book, and long paragraphs that take up a large part of the screen only make it harder. At most, keep your paragraphs to 3 sentences, and try to vary the length of your paragraphs to create plenty of breaks for the reader’s eye as they navigate the page. You can even use single-sentence paragraphs. Or, ones with only a few words. Writing like this creates a certain rhythm to your post and, although I’ve not formally studied this, I have a feeling that everyone develops their own signature rhythm according to their personality, style, and voice, kind of like a fingerprint. Something I only discovered recently is the idea of keeping the left reading edge of the post clean by not interrupting it with left-aligned images where the text wraps around the right of the image. Apparently, doing that disturbs the visual anchor in the reader’s mind, causing them to become more distracted or even to lose their place. It’s okay, though, to have small images aligned to the right, as that preserves the left reading edge and doesn’t seem to have the same negative effect. A lot of people will also scan the text of your post to pick out the key points, so you can use sub-headings, block quotes, bold, and italics to create visual checkpoints, as it were, that interrupt the scanning process and encourage the reader to slow down and avoid missing something important. Let’s talk about using photographs in the post for a moment – since we’re photographers trying to showcase our work, this is obviously an important part of it, right? The first thing I’ll say here is to please try not to go crazy with photographs in your posts! Every day, I see blog posts with about 30 words of text followed by 20 or more photos, one after another, but this is a wasteful and ineffective way to show off your images. I’ve compared it in the past to watching a failed fireworks display where all the fireworks go off at once – it might be spectacular in some ways, but it’s also overwhelming for the viewer. Instead, treat your photographs like the amazing ambassadors they are for your business, and choose the absolute best three to five images to include in your post. If you do want to include more photos, you can always create a slideshow of those as a video or a Slide Share presentation. What Are Your Photographs About? And, whatever you do, don’t just dump your photos into the post and expect the readers to instinctively understand the story you’re trying to tell. Instead, write a descriptive caption that tells the story happening outside the frame as well as inside it, and remember to use descriptive ALT and TITLE text on your photographs. I already mentioned the importance of avoiding left-aligned images, but it’s perfectly fine to center them or have them right-aligned, with the text on the left. On a side-note, WordPress allows you to make images clickable as hyperlinks, but it’s best to avoid having that link go to the image itself, which creates a browser window with only the image in it. Not only does that disrupt the user experience on the blog, it breaks the reader’s attention on your post, which can impact the completion of your goal. So, unless you want the image to link to another page or post, I recommend you set it to no link. While we’re on the topic of using photographs, it can be immensely useful to include client testimonials from the clients in those photos to provide social proof for readers, as well as give the client’s perspective of their actual experience. You can also include testimonials in your posts whenever you talk about a specific benefit or feature of the experience you had with the project or session you’re blogging about. I would also advise including testimonials in the posts directly, rather than linking out to another page created just for testimonials, because you want readers to continue reading the post wherever possible. And, to help testimonials stand out from the rest of the copy, you can use a different font and size, or include the testimonial in some kind of a break-out box or in a block quote. Finally, the last (but definitely not least) thing to think about in your blog post is the call to action. This is where you attempt to get your readers to complete the goal you set out for your blog post, and where so many people trip up because they surrender to the need to not be seen as blatant marketers or perceived as hyped-up sales people. We all really need to get over that one. Your blog is there to support your business, which needs leads and clients for it to survive, right? So this is no time to be overly-cautious or hesitant about trying to make that happen. The problem is, most people (ourselves included here) surf the web in a somewhat semi-somnolent state. They’re not actually asleep, but they’re in some kind of mental state where clicking around a website is almost on auto-pilot. They’re browsing around, but not really paying full attention most of the time, so it’s very easy for them to miss a call to action unless it’s blindingly obvious. For that reason, it must stand out on its own, and shouldn’t just blend into the background. A good call to action is strong, clear, to the point, and leaves no room for ambiguity. Now, you don’t have to go all retro on this and resort to flashing text in obnoxious colors that scrolls across the page, or anything like that, but it should be obvious to the reader that you want her to do something, and what that something is. Also, take a look at the finished post and be aware of any page elements that might be near to the call to action that might distract the reader or lead them off down a path where they can get needlessly distracted. When I first started to think about how to answer the question of how to write a good blog post, I had no idea there would be quite so much to it, and we’ve barely even scratched the surface here – I’m sure you have more questions about some of these answers than you did when we started, right? Just to recap what I’ve talked about here, I looked at why photographers struggle with writing blog posts that are unique, and some ways you can make that happen.